The Santa Clara County Juvenile Probation Department Pro-Com Athletic League comes to Wheeler Auditorium on Fridays! Games are usually held at 12:30 p.m. and are officiated and managed by volunteers. The players are from local (Gilroy, Morgan Hill, San Jose) continuation high schools. The league gives these athletes the opportunity to compete in organized athletics, which they may not normally have the opportunity to do. Please go to the attached link below to read more about the Pro-Com Athletic League. 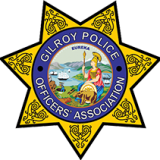 The Gilroy Police Department will be hosting a Coffee with a Cop event this Sunday, 1/28/18. The event will be held from 10:00 am to 12:00 noon at the Starbucks at 7050 Camino Arroyo. Please come out and enjoy a cup of coffee while interacting with your local law enforcement officers. Feel free to ask questions, raise concerns, or simply strike up a conversation. We look forward to seeing you all there! The Gilroy Police Officers' Association is sad to report the passing of "Twister". "Twister" is pictured here with his rider, Sgt. Greg Flippo (Ret.). "Twister" worked for the Gilroy Police Department from 1995-2015 and was an amazing asset to the Police Department and the City of Gilroy. Our thoughts and prayers are with Sgt. Flippo and his family during this difficult time.